Those children who are not completely up-to-date on every state mandated vaccine will be denied a public education " SB 277 impacts children in private or public elementary or secondary school, child care center, day nursery, nursery school, family day care home, or development center." 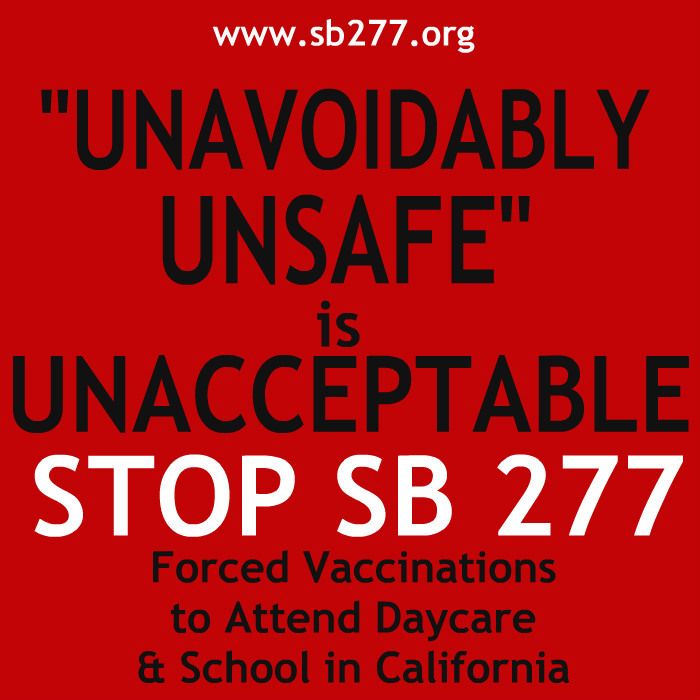 SB 277, would eliminate a parent's right to exempt their children from one, some, or all vaccines, a risk-laden medical procedure. Only a medical exemption would remain, which is usually only issued after a catastrophic adverse vaccine reaction has occurred, and often times, not even then. This bill would except a home-based private school from the prohibition described above of all if the school’s pupils are residents of the household or are members of a single family. California Vaccine Rate are on the Rise. Vaccination rates WENT UP from 2013/2014 to 2014/2015 from .1% to .4% California’s children are vaccinated at a rate of 97.46% !! 99% of parents utilizing the PBE for their children are selectively vaccinating. There is no health CRISIS! Measles outbreak is OVER! MMR (Measles vaccinations) INCREASED from last year to this year exceeding the 90% herd immunity rates! · Measles Outbreak: a significant proportion of the infected people were ADULTS who would not be affected by school vaccination laws. Under 200 cases in a state with 33.8 MILLION people the number of cases was relatively small and it never gained traction in the greater community. All three of these reasons do NOT support the need for mandated (no choice) vaccinations. find out more: 97.46 vaccination rate. Children today receive 69 doses of vaccines for 16 different viral and bacterial illnesses (49 before the age of 6) which more than doubles the government childhood schedule of 34 doses of 11 different vaccines in the year 2000. 35 doses and 5 more unique vaccines have been added to the schedule in the last 15 years. A vaccine exemption is filed regardless of whether the exemption is for one dose or all doses. Those supporting forced vaccination are being dishonest by not acknowledging the exploding vaccine schedule while sounding alarms over small increases in overall non-medical exemptions. Since education is compulsory, opting for no schooling will not be an option. When vaccine mandates are law, the only way a parent can protect their children from the known and unknown dangers of vaccines and/or from the known and unknown problems with the current vaccine schedule is through the use of exemptions. 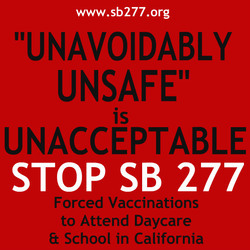 If SB 277 passes, there will soon be no more exemptions for such protections. Pharmaceutical companies are NOT liable for vaccine reactions: The National Childhood Vaccine Injury Act of 1986 established the National Vaccine Injury Compensation Program (VICP) as a federal no-fault system to compensate persons (or families of persons) who are injured by childhood vaccines, has paid out over $2.8 billion to families whose children have died or suffered other adverse reactions. In the past 5 years, an average of $221,000,000 has been paid out per year, which has nearly tripled from years before. Recipients of compensation are not allowed to speak of their case after its been settled. Manufacturers and the doctors who administer vaccines are completely shielded from liability for vaccine injuries and deaths. California is seeing red. Red shirts, that is. People showed up in droves (almost 1500 by rally coordinators count) to oppose California’s SB 277, which would remove the personal belief exemption for children attending public and private school, as well as daycare. They waited for hours, filling the halls, seven overflow rooms, an employee cafeteria and a basement room. All for a moment to stand at a microphone, say their name and that they oppose SB 277. Over four hundred of them, many of them families of the vaccine injured, or vaccine injured, themselves. It was a sea of red shirts. The largest turnout in 15 years. Unfortunately those parent’s pleas fell on deaf ears, as SB 277 was passed 6-2 and will go on to the next committee. The good news? 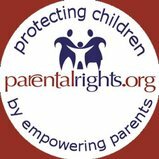 You still have a chance to stand up and fight for parental rights! April 15 - More and More red shirts more than 800 individuals down the corridors and out the Capitol doors waiting their turn to voice their public opposition to SB 277 in the education committee. 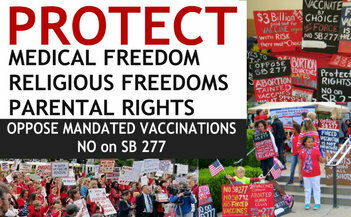 PROPOSED LEGISLATION Senate Bill 277 removes current vaccine exemptions. This bill will deny education opportunities to children who are not vaccinated on a government mandated schedule. SB 277 isn't solving a problem - it's creating host of problems including civil rights violations and religious rights violations. Mandated vaccinations infringe on parents rights and informed medical consent. California doesn't need SB 277. DAYCARE EMPLOYEES & PROVIDERS! FORCED VACCINATIONS ARE COMING FOR YOU!! 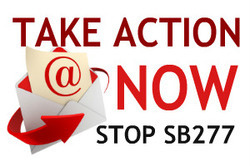 Senate Rules has referred SB277 to Health, Education and Judicial Committees! The bill will have public hearings in each of these committees. Senate Health Committee on April 8, 2015 by a vote of 6 yes and 2 no, with Senator Hernandez abstaining. Ayes: Hall, Mitchell, Monning, Nguyen, Pan, Wolk. Noes: Nielsen, Roth. Opponents coming to the microphone to voice opposition outnumbered supporters by a factor of almost 10:1. If it passes Education committee it has to be heard at the Judiciary Committee. We need to focus our attentions on all of those committee members. We need to call, fax, email and make appointments where possible. Each Senate committee will hold a hearing and we need to DEMAND a full informational hearing in each one. Sending your emails to the Senate Education Committee Members? copy this list and paste it to your BCC of your email. They will each get it. ***PLEASE NOTE There have been changes to the Education Committee. Adjust your email lists/correspondence accordingly. 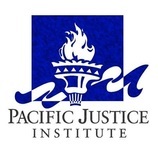 With sincere gratitude to our friends and allies at Pacific Justice Institute for joining us in taking a STRONG stand against SB277. Read their letter ﻿here﻿. 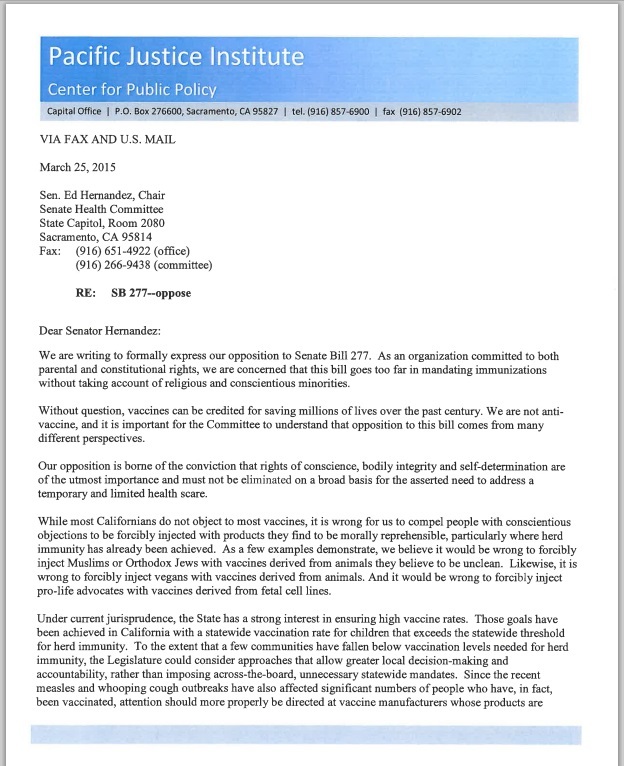 for their letter of Opposition to SB 277. 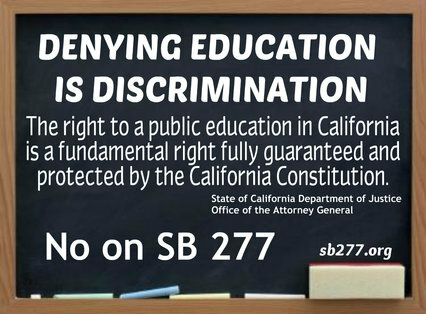 I oppose SB277 because I believe in the right of an individual to make the decision for what is best for themselves or their family. Whether I choose to vaccinate or not vaccinate should be up to me, not the government. We know our needs and concerns of our family more than the government. The government should understand the love we have for our children and we do what is best for them. The issue with SB277 is freedom of choice! 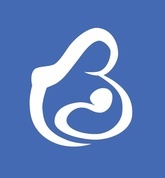 - L.C.